Next is to form the second loop. Wrap the thread around your needle again, this time bringing it over the first loop and around to the other side. 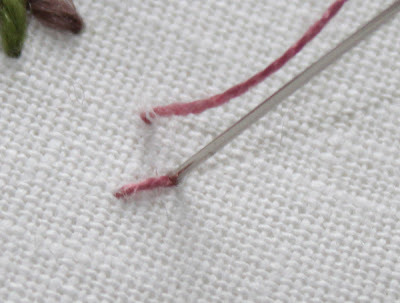 Now hold the thread with one hand while you push the needle down close to where you brought it up. If you let the thread slack just a little you will end up with a slightly looser knot with more thread on the top. Now you are done! Not so hard. I made a small sampler with colonial knots and french knots in order to compare the two. I think you can tell that the colonial knots end up slightly bigger as they have a bit more thread sitting on top the fabric. You can vary the threads as I have done, depending on the effect you are after. You can mix two colors for a more interesting coloring - I did this on the bottom two samples with a light and dark green. Then bring up the needle down a bit and thread the the needle though the 2 straight stitches, be careful to not divide the stitches with the needle or things will get a bit distorted. Bring the needle down in the same hole to form the loop. Next begin a new stitch by bringing up the needle straight down from the first stitch, ideally to make the same angle as the previous stitch. Then put the needle down through the fabric just below the previous loop stitch. Make another straight stitch on the other side, and form a loop as above. Now the variations, which there are quite a number of. You can stitch them as single units. Either in a vertical row, or a horizontal row. Consider using two different colors and vary the ending. You can continue making loop stitches or maybe add a bit of back stitching or both! It's quite an interesting effect. You can easily add beads. Just put a bead on in the middle of the loop stitch, or perhaps on the straight stitches. If you add to the loop, you may need an extra little horizontal stitch to keep the bead straight. So these are only a few of the possibilities there are many, many more! This is a quick little project. I didn't do really any stitching last week because I wasn't sure what I wanted to do next. Sometimes that happens after a big finish. But I just decided I could find a small project to do that might be fun. So I picked this since I am making a little collection of food-themed embroideries to put in the kitchen. I managed to squeeze in 10 different stitches in this little project! I thought that was quite good. Saved myself from doing a whole lot of satin stitching, and succeeded in making the project lots more interesting than it otherwise would have been. I am happy to have this complete. It was a bit of a challenge with all the wired parts, but that's what I wanted. I will be trying some new things with them soon. I haven't had much time, or maybe I have, just let other things and projects come first. But this weekend is a long weekend and the bluebird project will be done! For once, I remember to take a few pics while I was working on something. Here I have begun the bird's body. As you can see, I am filling it with long and short stitches. I added a bit of darker blues in the bird for some shading. For the wing, I couched down a 30g wire, then around I go doing buttonhole stitches. I switched colors because the wing darkens quite a bit on the lower part. Now I have all the little pieces for the whole project collected. There is more than one to say the least! First I will sew on the bird, after that, I will probably do the ladybug and daffodil. The only stitching left really is the butterfly body. Soon, I will finally be finished. I also have worked on two small projects in between this one, pictures of those coming soon.